solutions they will use to synthesize Prussian Blue pigment. SAIL Chemistry camp offers campers the opportunity to explore the ways in which chemistry affects our lives, from food chemistry, to forensic science, to manufacturing sustainable products. 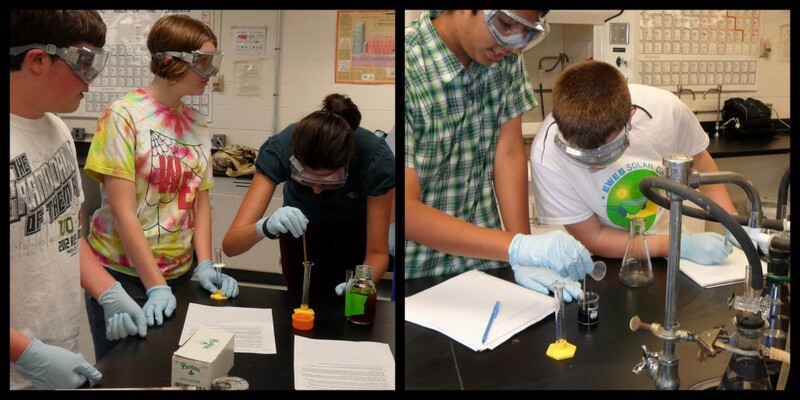 Campers engage in hands-on activities in a college chemistry laboratory and presentations centered around chemistry themes such as Polymers, CSI, Food Chemistry, or Materials Science. Our campers have designed batteries, analyzed ink and fibers, identified an unknown powder, made their own biofuel, collected and tested water samples, made their own water filtration systems, and synthesized metal pigments. SAIL Chemistry camp is sponsored by the University of Oregon Department of Chemistry and Biochemistry with support from UO Women in Graduate Sciences. The Summer Academy to Inspire Learning (SAIL) is a University of Oregon program led by volunteer faculty, and aimed at increasing students’ enrollment and success in college. SAIL invites 8th through 12th grade students that qualify for the Free and Reduced Lunch program to attend free, annual academic summer camps until they graduate from high school.